Back when Chrome OS was first made public, people would often dismiss it as "just a browser" on a laptop. Fast forward to 2018, and while Chrome OS might not be able to perform every single task a full-fledged desktop computer can, it can certainly handle essentially anything an average user would need. Today, Chrome OS is able to run Android apps, work offline, and even do boring desktop stuff like change the wallpaper. That boring desktop stuff may seem rather unappealing, but it also consists of a lot of the little conveniences we've become used to. One of those conveniences is being able to support, and work properly with, an external display — and while you'll already have no problem hooking up an external monitor to a Chromebook, the experience can stand to be improved. 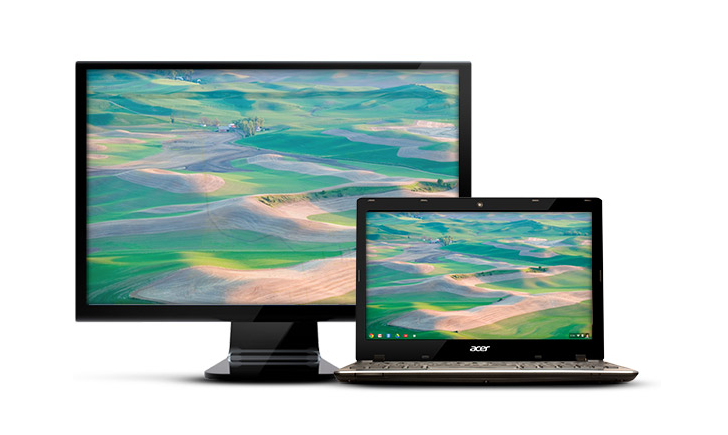 The Chrome OS team has been doing precisely that, and beginning with the Dev Channel, Chrome OS will now remember window positions across displays when disconnecting and reconnecting an external monitor. If you've ever used an external display on a PC before, the behavior is likely familiar to you since Windows handles window placement the same way. To explain how this works a little better, imagine you were using an external monitor and had window A on your Chromebook's display and window B on the external display. Disconnecting the monitor would obviously move both windows onto the Chromebook display, but now reconnecting the monitor will move window B back to the external display while keeping window A where it is. The feature is still in its experimental phase, so if you'd like to try it out, you'll have to enable the flag at chrome://flags/#ash-enable-persistent-window-bounds.